1. Mix the thyme and vinegar with 1 crushed garlic clove and 1 tbsp olive oil. Pour over the steaks, rubbing it in; set aside to marinate. Combine the mustard and fromage frais; set aside. 2. Heat the remaining oil in a pan and add the leek and remaining garlic. SautŽ for 5 minutes, then stir in the cannellini beans and stock. Simmer for 2 minutes, then mash. Stir in the lemon juice, season and keep warm. 3. Heat a griddle pan over a high heat. Brush the marinade from the steaks, then cook for 2 minutes each side for mediumrare; set aside. Wipe the pan with kitchen paper, then add the green beans to the pan and pour over any leftover marinade. Toss constantly, cooking for 2-3 minutes until the beans are tender. 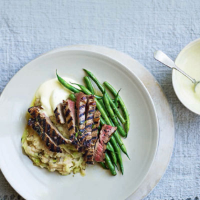 Slice the steak, then serve with the mash, beans and mustard sauce.